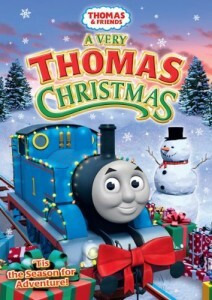 Thomas the Train takes you, the viewer, and his friends on a very Merry Christmas adventure, one certain to bring joy to you and your family this year. Rheneas has to pick out the perfect Christmas tree and Charlie discovers how snow can be a lot of fun, particularly when shared with friends! Edward finds a great story to tell Salty, and Emily learns how to be useful! A great adventure story for your family to enjoy this year. Company: Lyons / Hit Ent.